Sometimes I just think funny things: Don’t even get me STARTED on rude cashiers. Don’t even get me STARTED on rude cashiers. So my latest beef? Beef. Or, rather, grocery-related products. The persona I now assume upon returning home from any trip to the store, whether it's for nine bags of groceries or ice cream cookies flax-infused tofu bars, is that of a grumpy old woman. One who will drive 30 miles out of her way to save $2 on gas, one who complains about the noise, oh the noise, oh the noise noise NOISE NOISE. One whose voice rises to levels previously reserved for discussing war criminals, when ranting about the price of CEREAL. In other words, my mother. So, my mother (me) returns from the grocery store, mumbling under her breath about the price of groceries, and WORSE, how the manufacturers think we're IDIOTS, as if we're not going to NOTICE that every product in a cardboard box or plastic BAG has shrunk by at least 25%. BUT THEY'RE CHARGING THE SAME PRICE. This week, however, I returned home from the store, unpacked my [overpriced] groceries, and pulled out the package of chicken breasts to make fajitas. I cut it open and proceeded to slice them into strips. Only, here's the thing, oh irony of ironies. These boobies babies were so huge, I felt like I should be carving them to serve with a dish of jellied cranberry sauce* and a side of family drama. I counted the number of breasts in the package, looked at the total weight, and after a lengthy mathematical thinking session complete with fingers, toes, and a calculator, deduced that these chicken breasts weighed, like, a pound each. Aren't whole chickens, like, 3 ½ - 4 pounds altogether? So either these are some seriously giantess chickens (which would haunt my dreams) or these are normally-sized chickens who are really, really well-endowed. Raised by some perv farmer, to boot, who like his chickens to be 50% breast. In summation, food manufacturers: ripping us off, royally. Chicken farmers: weird freakos who raise unnaturally large chicken breasts. Which, this week at $top & $hop, were $1.99 a pound! Manufacturers who get my thumbs-up this week? Bausch & Lomb, for putting out a clear, nay, opaque bottle of multi-purpose saline solution. It's salt water you can see! 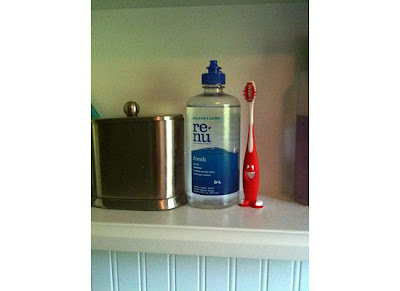 It's like having an ocean view every time I open my medicine cabinet! See? Even the toothbrush is excited! *jellied only, please. No whole cranberries allowed on Guwi's plate. You know, I was looking at different saline solutions today and I think I'll go back and get that one. I didn't know it was in a clear bottle. I like that.